The genus Coenobita is a species of terrestrial hermit crab, living on land near the coasts, distributed in tropical zone, classified in the family Coenobitidae with one another genus: Birgus latro (known as Coconuts Crab); additionally, are in the same superfamily as Red King Crabs and Hanasaki Crabs. Approximately, their body structures and the usage of seashells for protecting the bodies are same as the other hermit crabs, yet are different in habitats compared with the other marine hermit crabs which are not appear on the water often, therefore terrestrial hermit crabs have stronger legs and chelipeds (claws), thus correspond to Coconuts Crabs as they are in the same family. 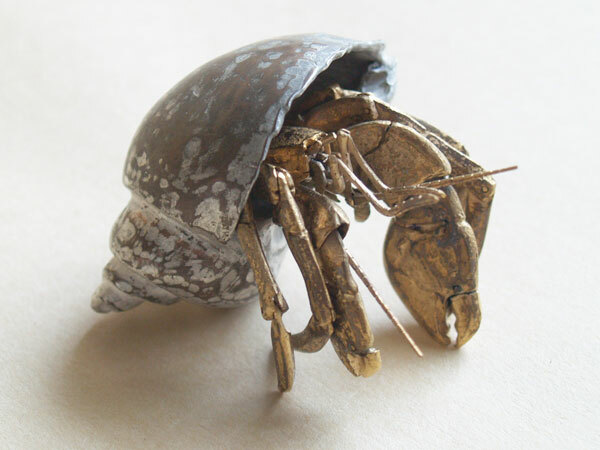 For the adaptation of living on the land, terrestrial hermit crabs store small amount of water in the shells, to prevent their abdomens from dryness, and to enable branchial respiration on the land, yet that requires them to supply or change the water on a regular basis, therefore they can not be far from the waterside. The average of their life expectancy is not clear precisely, yet is said 10 to 30 years. As the other crustaceans, they repeat ecdysis and grow during their lifetime, therefore, they become as big as they have lived. In some cases, they need to change the shells as they grow. The dimension of the shell and its hole are measured with their chelipeds (claws). It is uncertain how they remove their excrements once released in the shells to the outside, but is possibly flushed away or swept out by the legs in the water, considering their habit of supplying water to the shells. In 1970, Coenobita was specified as a natural monument of Japan, to respond to their population decrease in Ogasawara Archipelago, on the other hand, this was pointed out that had been done due to its rarity in Honshu (the main island of Japan) where Coenobita hardly inhabits. In 1972, after the reversion of Okinawa to Japan, Coenobitas in Nansei-shoto (southwestern islands of Kyushu and Okinawa archipelago) were included in the natural monument, yet they were known as very common creatures in Okinawa, sold as popular fish baits, as the fact that there were the captor specialized for them. Afterwards, the capture was approved for the designated captors in some parts of the district to save their lives, with the limitation of the capture amount, due to the fact that the population was not few to be protected as the natural monument. Currently, Coenobitas are purchasable (mainly as pets) via aquarium fish dealers, yet are mostly being captured by the designated captors mentioned above. One of the major toy companies started to sell Coenobita breeding kit as a kind of toy, promoted their popularity as pets, yet the protection law can not be applied to such crustacean caused numbers of problems. The worst was the packed Coenobitas into the transparent plastic containers with the breeding kits, were sold like sets of tools though Coenobitas were the pricipal creatures, thus happened due to the commodity law: as long as they were commodities, they had to be within the packages; led them to resultant death by dryness, and were exposed at the shops helplessly. Obviously, the contents of the breeding kits were so poor, and not premised for long-term breeding. Moreover, this breeding kit was commercialized with the catchphrases “It loves popcorn, can live with tap water”, in order to emphasize its ease to draw attentions from impulsive consumers like whom would have thought “It is not so expensive…” or “The seashell is beautiful…”, and threw things with weariness, but basically the Coenobitas in this breeding kits could not have survived longer. Such breeding kit was featured by mass media, made wrong images as if it was easy to have, or could be like an interior decoration. Consequently, thus increased the number of the shops (e.g. pet shops, supermarket, hardware stores…) which handle Coenobitas without understanding how to treat them, that caused: “The dying in the over cooled shops.”, “Being overpacked in the small containers.”, “Being abandoned without water nor any feeds.”, as that are still being reported. In spite of this, the reaction of the executive branch is very slow, therefore the numerous animals are dying because of such rough treatments, though they are the natural monuments. It is known well that Coconut Crabs drown in water, but is not the case of Coenobitas which spontaneously dive into mere water holes and the sea to supply the water, though they are unable to feed and shed their skin in the water, therefore they can not keep staying in water; one of the catchphrases for selling “It is easy to have without water.” has a disputable point that might have been exploiting the misinformation “Land hermit crabs drown in water.” to complement the mistakes each other. There are no terrestrial hermit crabs live in groups, but is misunderstood as though they make large groups, among the people whom unaware of that, because of the TV programs often feature the scenes that Coenobitas are gathered around coasts for spawn. Several years before, a certain dealer spread a demagogy “It would be better to have them in groups, as they live in groups.” intended to sell a large number of land hermit crabs. Subsequently, the large scale of sales campaigns were conducted via Blogs, 2channel (a Japanese internet forum), BBS…etc, yet thus were not clear whether that were prearranged, or happened spontaneously. Coenobitas are expert at tree climbing as Coconut Crabs are so, able to clime up unexpectedly tall trees, but from the owners’ point of view, they are experts at escaping, for instance, once I was awakened by the sound of my land hermit crab climbing up the wall near by my pillow. Additionally, I have loved them since early childhood, had an empty shell with a belief that there was a crab deep inside of it, and was digging it with wire everyday. In this work, I groped for a new style of Jizai Okimono, that enabled Coenobita’s distinctive habit of hiding itself in the shell; comparatively, the traditional one were only enabled to move their joint part of the limbs. One of this works was swapped with a jewelry artist David Bjelander whom I met in Germany and extremely loved this.